Whispers in the Loggia: It Happened. Again. The Pope listened to the stories of the victims and offered them consolation in the chapel of St Mary's Cathedral. The unscheduled meeting followed his public apology at the weekend to all Australian victims. "A group of victims [two men, two women] attended a papal private mass this morning," the Vatican said in a statement. 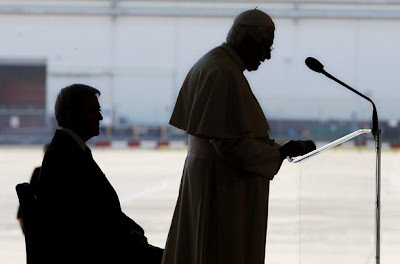 "He [the Pope] listened to their stories and offered them consolation. The Archdiocese of Sydney said it had nominated three victims to attend the meeting. "We are delighted that the Holy Father was able to spend time with victims of sexual abuse before his departure today," it said in a statement. "This private meeting was organised late in our preparations. The Professional Standards Office of New South Wales nominated three victims to meet the Holy Father, and the meeting took place this morning following a private Mass which the Holy Father celebrated for them. "The Holy Father's meeting with victims reflects the continuing commitment of the whole church in Australia to bring healing and justice to those who have been so terribly hurt by sexual abuse." There have been 107 convictions for sexual abuse in the Catholic church in Australia but victims groups say there may be thousands of cases. Melbourne man Anthony Foster, whose two daughters were raped by a Catholic priest when they were in primary school, had returned from a holiday in Scotland last week to seek a meeting with the Pope about sexual abuse. "I'm happy for the people who did meet him, if it helped them. But I think [the church] has lost an opportunity to speak to people like us and Broken Rites [support group] who truly represent the needs of all victims." 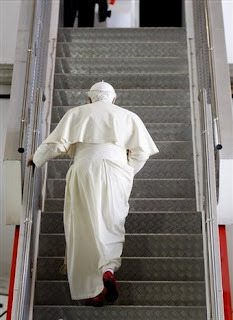 He was at the airport this morning in a last-ditch attempt to give the Pope his suggestions for improving the church's response to survivors of abuse. Mr Foster and his wife, Christine, believe the church's handling of the issue contributed to the suicide in January of their daughter Emma, 26. 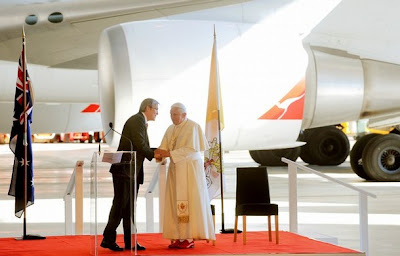 Only on the bus en route to the Pope's farewell at Sydney airport was the press pool alerted that the meeting had taken place. Before I take my leave, I wish to say to my hosts how much I have enjoyed my visit here and how grateful I am for your hospitality. I thank the Prime Minister, the Honourable Kevin Rudd, for the kindness he has shown to me and to all the participants at World Youth Day. I also thank the Governor-General, Major-General Michael Jeffery, for his presence here and for graciously receiving me at Admiralty House at the start of my public engagements. The Federal Government and the State Government of New South Wales, as well as the residents and the business community of Sydney, have been most cooperative in their support of World Youth Day. An event of this kind requires an immense amount of preparation and organization, and I know that I speak on behalf of many thousands of young people when I express my appreciation and gratitude to you all. In characteristic Australian style, you have extended a warm welcome to me and to countless young pilgrims who have flocked here from every corner of the globe. To the host families in Australia and New Zealand who have made room for the young people in their homes, I am especially grateful. You have opened your doors and your hearts to the world's youth, and on their behalf I thank you. As I look back over these stirring days, there are many scenes that stand out in my mind. I was deeply moved by my visit to the Mary MacKillop Memorial, and I thank the Sisters of Saint Joseph for the opportunity to pray at the Shrine of their Co-Foundress. The Stations of the Cross in the streets of Sydney were a powerful reminder that Christ loved us "to the end" and shared our sufferings so that we could share his glory. The meeting with the young people at Darlinghurst was a moment of joy and great hope, a sign that Christ can lift us out of the most difficult situations, restoring our dignity and enabling us to look forward to a brighter future. The meeting with ecumenical and interreligious leaders was marked by a spirit of genuine fraternity and a deep desire for greater collaboration in building a more just and peaceful world. And without doubt, the gatherings at Barangaroo and Southern Cross [Vigil/Mass] were high-points of my visit. Those experiences of prayer, and our joyful celebration of the Eucharist, were an eloquent testimony to the life-giving work of the Holy Spirit, present and active in the hearts of our young people. World Youth Day has shown us that the Church can rejoice in the young people of today and be filled with hope for the world of tomorrow. Dear friends, as I depart from Sydney, I ask God to look down lovingly upon this city, this country and all its inhabitants. I pray that many of their number will be inspired by Blessed Mary MacKillop's example of compassion and service. And as I bid you farewell with deep gratitude in my heart, I say once again: May God bless the people of Australia! ...and with that, it's really a wrap.